Parking is plentiful. There are no bouncers to prevent you from entering before your allotted hour. Here, the unwashed masses are welcome. With the much hyped and much criticized opening of posh Mexican restaurant Red O, we thought it was time to take a look at the other Red O, the one that doesn't feature Rick Bayless as a chef consultant. The last outpost of an extinct Mexican restaurant chain, The Original Red Onion in Rolling Hills Estates once helped spread the gospel of Mexican food throughout Southern California. Their hybrid version of Mexican-American cuisine (often called Sonoran) was designed to appeal to as many people as possible -- and it did. For a while. Corporate ownership took its toll on the quality of the food. (A friend tells me the Red Onion he frequented in San Diego in the late 1980s was nicknamed The Spread Scumion because of its rep as a divey pick-up bar.) Newer Mexican restaurant chains like El Torito, Acapulco's and Chevy's, aped Red Onion's success and likely took some of its market share. Tastes evolved. The tacos and burritos that may have seemed exotic in the post-WWII era had, like spaghetti and chop suey before them, become thoroughly assimilated into the American palate. Los Angeles and Orange Counties now boasted hundreds, even thousands, of restaurants and taco trucks that didn't serve Mexican food geared toward Americans. 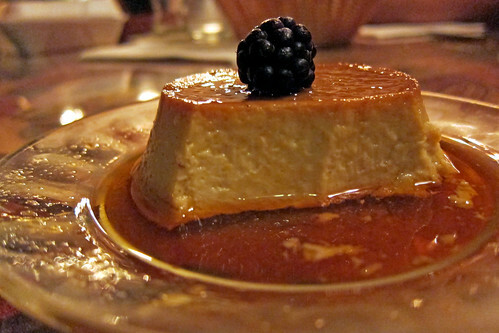 They served dishes from specific regions, towns, even neighborhoods for immigrants who craved a taste of home. 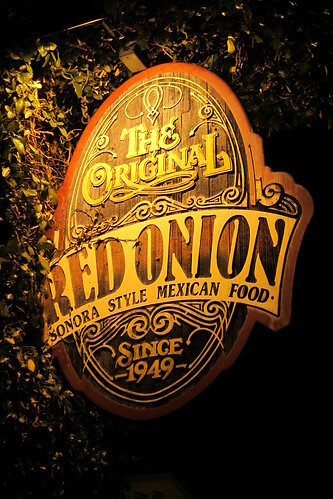 Despite the wealth of distinct regional Mexican cuisines available in Southern California, The Original Red Onion has hung on, flourishing under Jeff Earle, grandson of co-founder Harry. 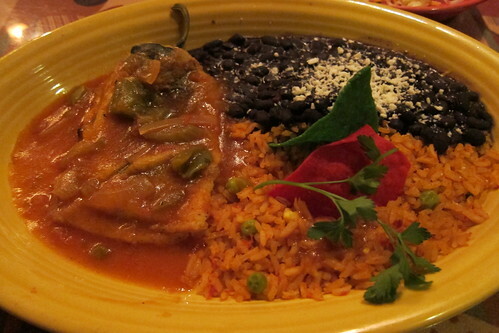 They still bring heaping baskets of warm, fresh tortilla chips -- and surprisingly good salsa -- to your table. The restaurant still serves large platters of chilli con carne comprised almost exclusively of husky chunks of beef and pungent red sauce. 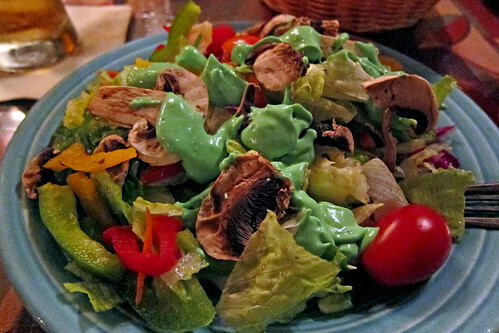 The salads still arrive with a full cup of avocado "dressing," shockingly green and as thick as sour cream. 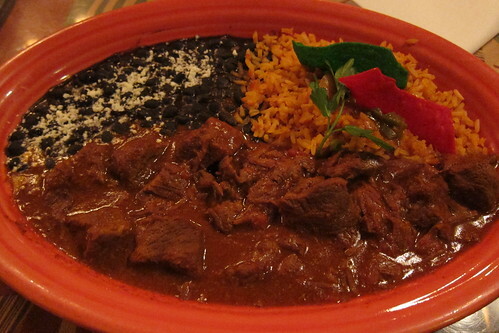 The food isn't posh or refined, but it's an iteration of Mexican food every bit as valid as a Veracruzano chilpachole or a Oaxacan mole. In almost every respect -- attitude, ambiance, cuisine -- Red Onion and Red O couldn't be farther apart. Where Red O wants to capitalize on the star power of chef Rick Bayless (even as he backs away from his involvement when the criticism rains down), Red Onion has had any number of line cooks over the decades working off the same recipes. While Red O cultivates an air of exclusivity designed to make diners feel grateful they've even been allowed to enter, Red Onion is a neighborhood restaurant meant for birthdays, celebrations and any night you don't feel like cooking. Red O's prices are steep, while Red Onion is a solid, midscale restaurant targeted at families and locals. The biggest difference: Whereas Red O will thrive or wither along with Rick Bayless' star-power in Los Angeles, Red Onion has been serving Mexican-American food for over 60 years and shows no signs of slowing down.